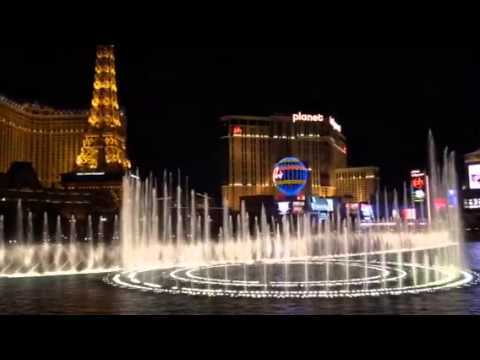 If you know someone who knows Vegas and they tell you that they know the best place to watch the fountains, and it is somewhere that is not named Yellowtail…. Ditch them, they are lying and also know nothing of Vegas. Or life. Firstly, an amazing cocktail in your hand. If your friend (that you will soon be ditching) told you to grab yourself a yard glass of premixed booze for the show, then you should spread the word and tell your other friends to ditch them too. Secondly, an Alfresco table to sit at with an elevated view of the entire lake without a) obstruction. b) a sea of tourists snapping photos. 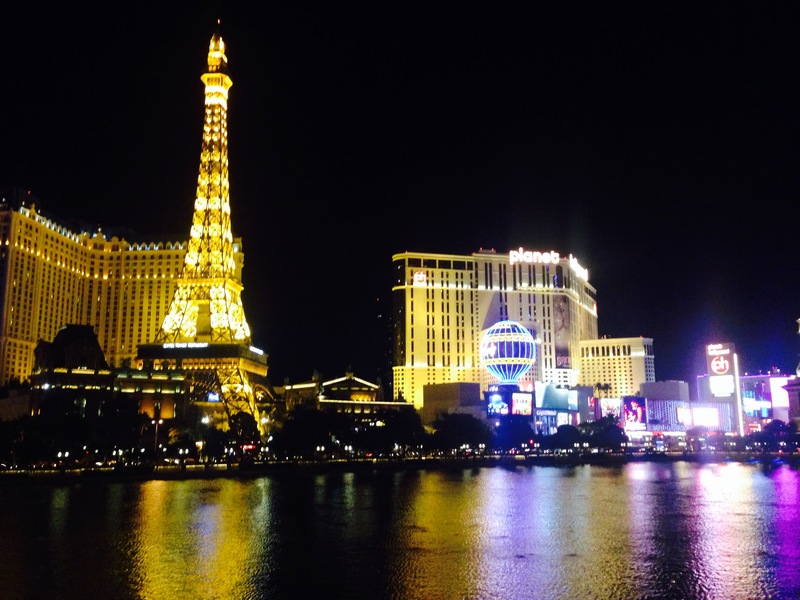 Thirdly and most importantly, the real thing you miss is the backdrop of the Las Vegas strip. You can see the fountains in the way that you imagined, being flanked by bright lights, jaw-droppingly huge buildings, gathered crowds and the hustle that is Vegas. 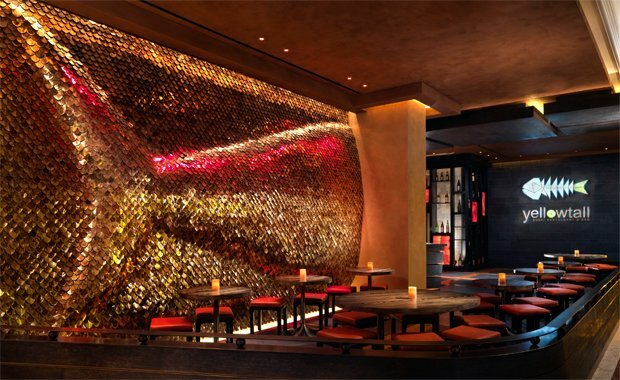 The restaurant is cool and modern inside with a Giant yellowtail sculpture that is big enough to make sure you dont for one second forget that you are in Vegas. My Tip? Walk straight past that sculpture and head outside to the terrace. Dining here without seeing the lake, while lovely, is the equivalent of going to Niagara falls, and not venturing past the beautifully decorated gift shop… Ok this is a slight exaggeration but you get my drift. I have been twice and actually like dining inside also but if you take any advice, it is to have a cocktail at least on the balcony. The chef is Akira Back. (Pretty strong name) and as well as being exceptionally talented in the kitchen, he used to be a professional snowboarder… (Upping the cool factor 10 fold). For me, for the speciality rolls, the Beef roll with coleslaw was sensational, though admittedly a little confusing for my senses. You dont expect what is essentially Barbecue food to appear in your Japanese Sushi Roll. For me, it worked well in obviously loving all things meat. 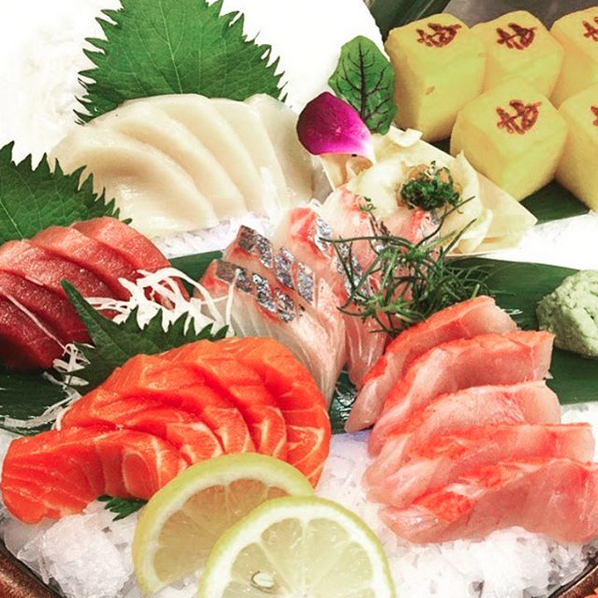 I need to also give particular credit to their Sashimi collections… when I say collections, they are more like the very best selections of your sashimi dreams. On mass. Usually, I feel that dessert always slightly neglected in restaurants that specialise in high end Japanese cuisine. I have been (on many occasions) stumped to find something more creative than Matcha Ice Cream, some Dango, Matcha Cakes and usually some sort of fruit selection. 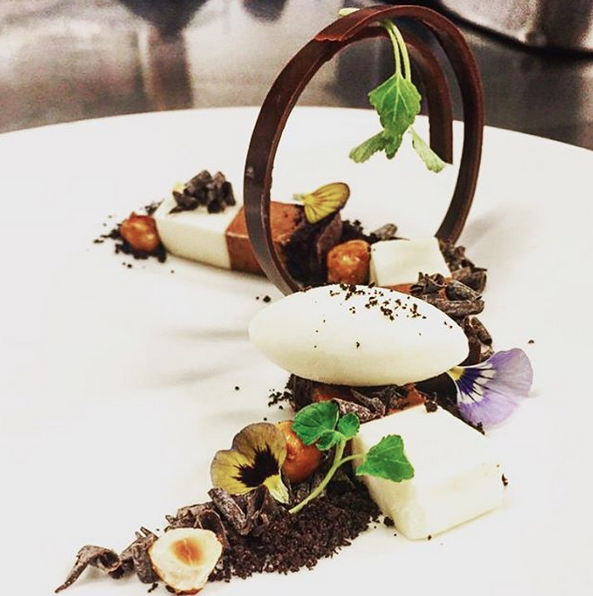 If we can talk seriously for a moment about their Chocolate Mousse cake with Tiramisu Ice Cream and Edible Soil…. It is really something special. They also have zero hesitation in fashioning something off piste for special occasions… Or particularly large casino win celebrations. Cocktails. These are a pretty serious order in this restaurant and you can see why when you taste them. I opted for the “Essence” which is Square One cucumber Vodka, white cranberry and cucumber puree. I mean, you need to love cucumber, but luckily I am a big fan of cucumber in my drinks and so this for me, was a winner. My guest had a Lychee Martini. Having had several around Vegas, this was the winner using Ty-Ku (Sake) as a little extra warming kick. On the subject, they also offer Vegas’ most expensive Sake, at a punchy $2,400. “Aged for 10 years in a customised cooler, Frozen Beauty Sake offers the most demanding of palates a chance to taste perfection while enjoying their Yellowtail meal.” I have never been a huge fan of Sake on its own so unfortunately we didn’t spring for this, though I am assured by the staff there that it is worth every dime. Inside is pretty cool and chic. I would say its one of the most trendy of the Bellagio restaurants and attracts a well dressed, well travelled crowd. It has played host to every celebrity that you can think of and is always on the most desired dining list for regulars. My advice? 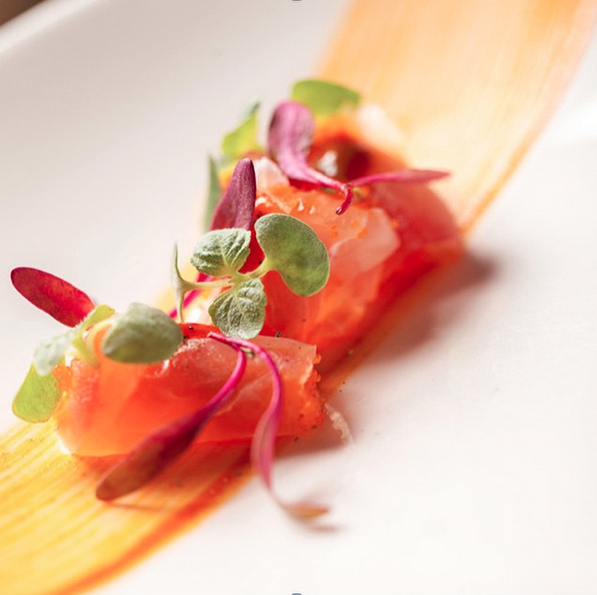 If you like great Japanese food, you like Unrivalled views and you want something a little special, go to Yellowtail… Then hit the tables.